The instructions below are for trees and shrubs sold in plastic containers. We will be adding other references for bare root or balled-and-burlaped trees and shrubs soon! Dig the hole approximately 2-3 times as wide as the soil ball. Measure the height of the root ball. Dig the hole 1-2 inches less than that height. Do not dig deeper or the plant will be too deep once the disturbed soil settles. When digging is complete, roughen up the sides of the hole. This will help the roots grow into the soil. Remove the plastic container from the root ball. 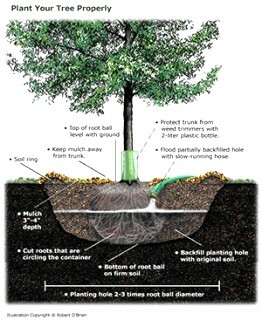 If the roots are growing in a circle, make 3-4 shallow cuts down through the roots and the soil ball. Backfill the hole using the original soil dug from the hole. Poor soils may benefit from the addition of organic soil amendments, but you should never completely backfill with an amendment. If you use a soil amendment, mix it thoroughly with the original soil prior to backfilling the planting hole. In most cases, plants will grow best if the original soil is altered as little as possible. 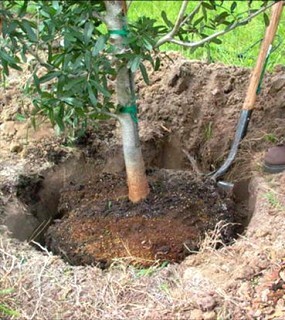 As you fill the hole, backfill evenly around the plant to keep air pockets at a minimum. Once your planting hole is approximately 3/4 full of backfill, water the plant thoroughly to further eliminate air pockets in the backfill. Then completely fill the hole and water thoroughly once again. Never water automatically without first checking the soil to determine if watering is needed. To do this, test the moisture of your soil about 4-8 inches deep. If it is dry or only slightly damp, the plant should be watered. Sandy soil generally will need to be watered more frequently than clay soil, but always check before automatically watering the plant. Roots grow where oxygen and water are most available. Watering deeply and thoroughly and only as needed will encourage a deep and healthy root system that will be able to withstand environmental stresses. A layer of several inches of mulching material such as wood chips will help retain soil moisture and help to prevent wide fluctuations in soil temperatures throughout the year. It will also inhibit the growth of weeds around the plant. Just as you should not plant too deeply, neither should you mulch too deeply. Taper mulch away from the stem. So not pile much mulch against the stem.